Built to challenge the Toyota Camry Hybrid, the previous-generation Hyundai Sonata Hybrid didn't exactly set the world on fire. Lower than expected fuel economy, a catfish-like maw, and a rough powertrain made it clear the hybrid wasn't the most competitive entry in a growing segment. For 2016, a second-gen Sonata Hybrid comes armed with a new and improved powertrain, more space, and upscale appointments. A plug-in variant will also be offered for the first time. 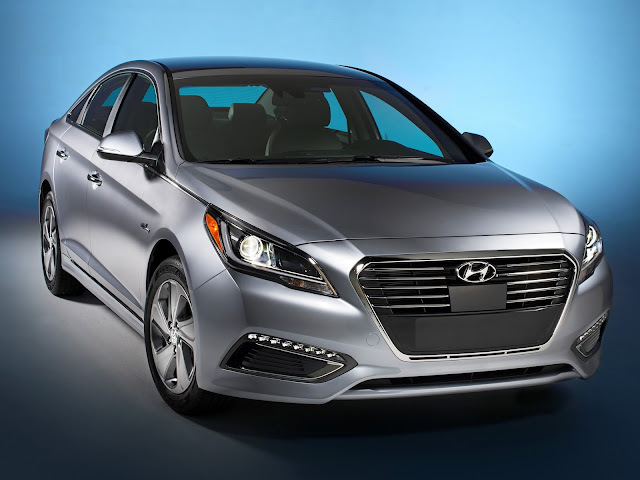 The 2016 Sonata Hybrid's powertrain is an evolution of the one found in the previous generation, combining a new 154-hp, direct-injected, 2.0-liter inline-four with 140 lb-ft of torque and a 38-kW electric motor for a total system output of 193 hp. A six-speed automatic remains the only transmission available, and the lithium-ion battery is now a larger 1.62-kW-hr unit that sits under the trunk's floor. When it comes to fuel economy, the Sonata Hybrid succeeds, with our range-topping Limited trim test car rated at 39/43 mpg city/highway. The entry-level Sonata Hybrid SE is more efficient at 40/44 mpg thanks to lower-resistance tires and smaller 16-inch alloy wheels. Around town, you can turn the 2.0-liter I-4 into a generator and use it in combination with regenerative braking to keep the battery charged. While cruising at highway speeds, the gas engine turns off when there's sufficient battery charge, enabling you to maximize EV-mode driving. If you need more power to merge or pass slower traffic, the gas engine restarts smoothly with little shaking or rumbling. The six-speed automatic transmission shifts smoothly and is rarely caught in the wrong gear. You can shift the gearbox yourself, but it's best to leave it to its own devices; it's slow to respond in manual mode. Though the Sonata Hybrid performs well on twisty roads, it's more at home in the city and on the highway. The suspension soaks up potholes and rough roads, giving it a reasonably damped ride. However, on less-than-perfect surfaces, there's a noticeable amount of road and tire noise in the cabin. On decently maintained surfaces, the Sonata Hybrid's well-insulated interior remains quiet. The brake pedal, on the other hand, was squishy and didn't inspire much driver confidence. When you brake gradually, the car doesn't feel as if its losing momentum, making it hard to stop smoothly. Senior production editor Zach Gale noted that brake feel wasn't linear and felt unnatural, meaning drivers will need some time to get used to them.At the track, the Sonata Hybrid ran from zero to 60 mph in 8.3 seconds and finished the quarter mile in 16.3 seconds at 86.5 mph. It's slower than the Toyota Camry Hybrid and Honda Accord Hybrid -- both of which hit 60 mph in 7.1 seconds -- but slightly quicker than the Ford Fusion Hybrid. Braking from 60 mph to a complete stop, on the other hand, took 121 feet, longer than all three of its chief rivals. The car completed the figure eight in 28.1 seconds with an average of 0.62 g and generated 0.80 g of lateral acceleration, putting it on par with other hybrid midsize sedans. In terms of handling, the Sonata Hybrid holds its own, though the Fusion and the Accord are more engaging to drive, with better steering and chassis tuning. The drive mode selector gives you a choice between Normal, Sport, and Eco modes, changing the throttle response, transmission shift points, and steering weight. Eco mode maximizes fuel economy but doesn't dull the throttle too much, and Sport mode makes the car slightly more responsive. Whatever mode you're in, steering is light and communicates better than in previous Hyundais but lacks feel.A Near-Premium Interior ExperienceGetting into the Sonata Hybrid's cabin, you're greeted by a well-appointed interior, with plenty of soft-touch materials and sufficient padding. While the black and blue leather is unique, the interior could use some bright silver trim and lighter colors to brighten things up. One knock against the hybrid's interior is the available panoramic sunroof, which squeaks and rattles quite a bit, especially over bumpy roads.The front seats are well-bolstered and supportive with plenty of adjustability for the driver and front passenger. Four passengers will be comfortable in the Sonata Hybrid, even for long drives, while a fifth passenger can squeeze in. Heated and ventilated front seats and heated outboard rear seats are also available. A driver-only mode for the climate control is standard, which helps save energy when driving in EV mode. You'll find plenty of cubbies for your mobile devices inside the Sonata Hybrid, including a larger storage area in the center stack, a mobile phone holder, a big glove box, and a large center console bin.Unlike the gas-only Sonata, there's only 13.3 cubic feet of cargo space instead of 16.3 because the lithium-ion battery is under the trunk floor. In comparison, the Camry Hybrid has 13.1 cubic feet of trunk space and the Accord Hybrid has 12.7 cubic feet. Those two, however, don't come with split-folding rear seats like the Sonata Hybrid. The Fusion Hybrid, on the other hand, does feature split-folding rear seats, but its 12-cubic-feet trunk trails the Sonata's.The Sonata Hybrid's infotainment system is user-friendly and features an 8-inch touchscreen that responds quickly to your inputs. There are also some hybrid-specific features such as an energy-flow gauge and a meter that rates how efficiently you're driving. Response to voice commands, however, needs improvement; you can't tell the system to play specific artists or songs out of your flash drive, and it frequently has a hard time understanding you. The Infinity by Harman Kardon audio system, on the other hand, delivers crisp and clear sound. The Sonata Hybrid is available with advanced safety features, including blind-spot warning, lane departure warning, rear cross-traffic alert, adaptive cruise control, and forward collision warning.A More Complete CompositionWhen compared to its predecessor, it's clear that the new 2016 Sonata Hybrid is a step in the right direction. The smoothness of the powertrain shows that Hyundai took the time to make big improvements to its hybrid midsize sedan to make it a stronger entry in its segment. At $35,550, the 2016 Sonata Hybrid isn't cheap, but when you consider an array of features usually found on pricier cars, the price starts making sense. Except for minor fit and finish issues and non-linear brakes, the Sonata Hybrid is a solid proposition, offering value, fuel efficiency, a smooth powertrain, and a well-appointed interior. In fact, the hybrid delivers similar levels of performance as its gas-only siblings but with the bonus of stellar fuel economy.